I have seen this idea around a few different sites but just in case you haven't come across it yet I thought I would share it here. 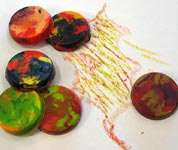 The idea is to use broken crayons and melt them in muffin tins. When they cool they will be a chunky crayon. Most of the sites mix the colors but I guess you could have the kids practice sorting colors and make them color specific too. Read more here for the exact directions.